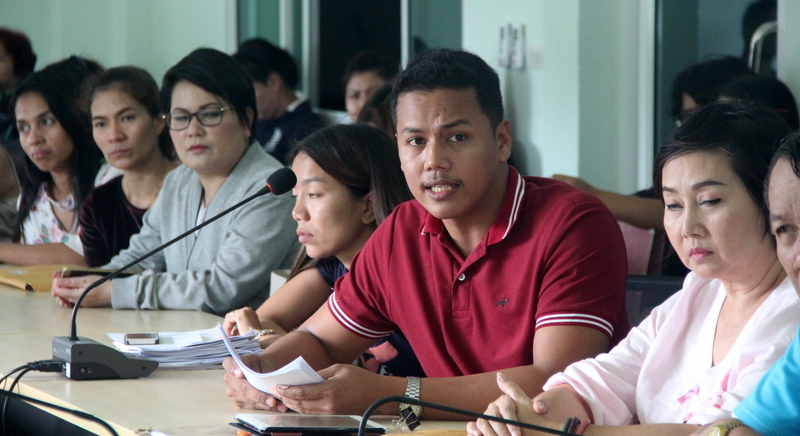 PHUKET: Angry vendors from the Phuket Floating Market filed a formal complaint with the Kathu District Chief this afternoon (Sept 20), calling for compensation from the market’s operator after promises of hordes of tourists flooding the market failed to materialise. The group, representing 73 vendors angry over their predicament, all operate stalls at the market, located opposite Loch Palm Golf Club in Kathu. 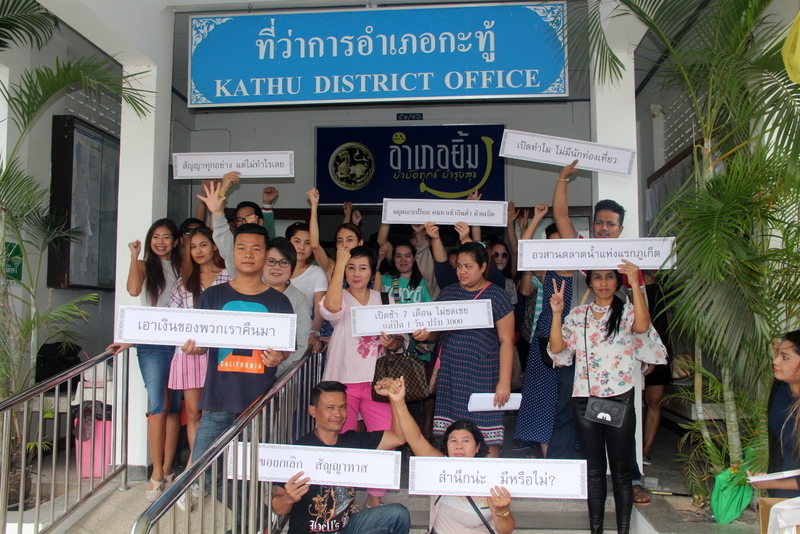 The vendors gathered at the Kathu District Office at 2:30pm today after their appeals to the Phuket Consumer Protection office and the Damrongdhama Centre (Ombudsman’s Office) were turned down. “I want my money back,” said Parichat Ruenrak, 24, who operates a small food stall at the market. “Then I want to cancel the contract and find somewhere else. We all want our money back,” she said. “Phuket Floating Market is a dream. Anucha Voranetiwong told us that a lot of tourists, especially Chinese, would be coming to the market, but there have been very few tourists since the market opened – and that has had a direct effect on our incomes,” she added. Ms Parichat explained that she signed a contract to occupy and open her stall at the market, and started paying rent for her stall, in November last year. “But we could not move in and open until the market opened. The opening was pushed back time and again – more than seven times,” Ms Parichat said. However, Ms Parichat – and her 72 fellow stall holders – under the rental agreement they each signed now face a fine of B3,000 per day if they do not open their stalls. 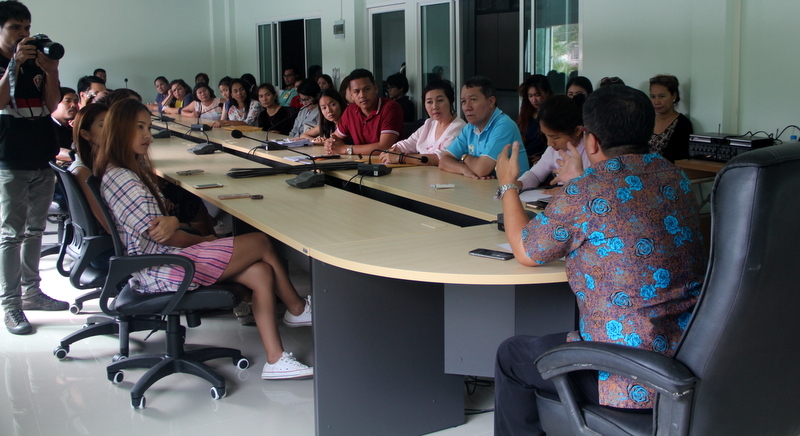 “Many people have filed complaints to the Damrongdhama Centre about the Phuket Floating Market, that the market is not attracting the number of tourists like we were told – and as promoted before the market opened – but there has not been any response from officials,” Ms Parichat told The Phuket News. “I invested B500,000 with my partner, that includes everything. Other people have spent a lot of money, also. I am really in trouble,” she said. 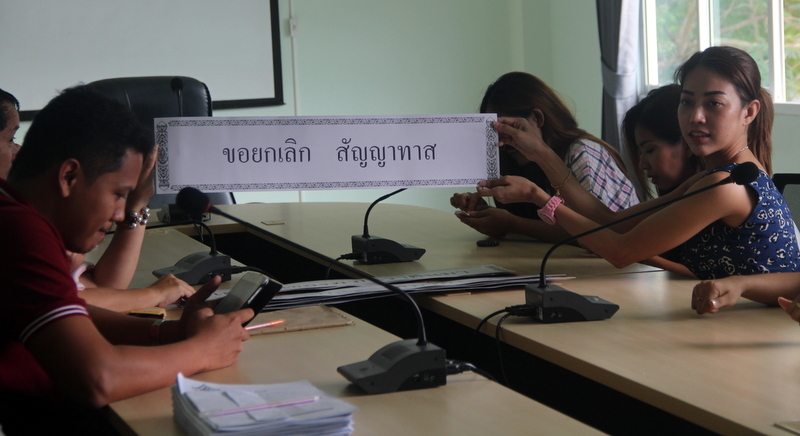 Many of the vendors The Phuket News spoke with said they faced the same predicament – they could not close their stalls to save money as they faced the same B3,000 a day fine. 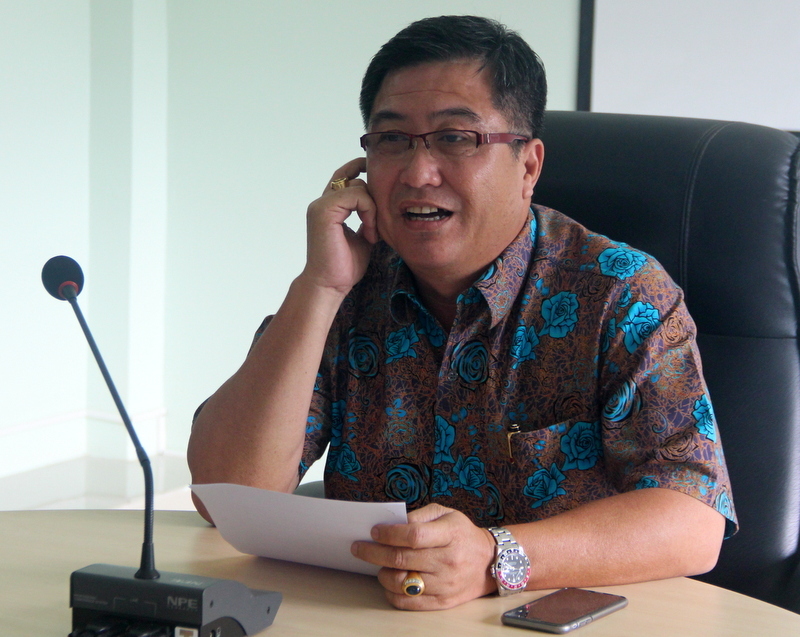 The Phuket News today tracked down Anucha Voranetiwong, General Manager of P. R.A. Solution Co, which operates Phuket Floating Market. Paully44...eagle has made a factual observation. The article was published in 20 September 2016, it's now August 2017. Given that Pavel reports that the buildings are now being demolished, what relevance now are your comments being directed to vendors? Nothing. Referring to past comments merely highlights inconsistencies in comments being made. Eagle; WTF is your comment about & how is it relevant to the article?? I thought trolling through all the old posts was something you did seeing as you constantly remind posters of what they said before with date/time etc. Just because you have nothing better to do, don't assume others do. Pauly44,many more old/outdated articles for you to comment on.Just scroll/troll through the archive! These vendors need to grow up, they made a poor business decision based on false promises, they only have themselves to blame, nobody owes them a successful business, get over it. Thanks for confirming my notice. Phuket has been my home a decade longer than you and I can also speak Thai. Seems to me, I threw away my RTG whilst you kept yours. Sir Burr...lol sorry to disappoint you. I am not an international reader. You know nothing about me. I could actually be Thai! You merely demonstrate the level of mentality and competency of commentators here. Sir Burr: Sorry, international readers also read the Bangkok post, and publications in international papers/tv. These are stronger opinions confirming my softer approach. Hope you can find your reading/reaction balance back. Telling other readers what to read or not to read is a bit weird. Doesn't? Other readers read what they like to read. Kurt: I do comment occasionally on BP under a different pseudonym and TV, i say occasionally because most of the comments are intelligently written not non factual, unconnected, garbage. Markthalang:  Right, you put the finger on the right thai 'wound'. As I just commented myself as well! Sir Burr: A very apt pseudonym. After 20 years of living on Phuket ( plus traveling around the country) i think i know Thailand, customs and traditions very well plus i speak almost fluent Thai. swerv: Why you not satisfy your thai patriotism by reading comments in Bangkok Post and 'fight' them? There is more 'heavy' work for you to do than in PN. Don't limit yourself just to the relatively friendly Phuket comments only. Do you dare such, as comments in Bangkok Post are much 'stronger' than in PN, and red more world wide either? Please don't take any posts by Kurt, swerv, or Joe12 seriously. They really haven't got a clue about living in Thailand, its customs, traditions, or how they see the world. All three of them post crap. Don't waste your time. I reside legally on a retirement visa. I've never heard of making guests get visas. Plenty of Thais reside in the USA, I would never dream of telling them to not express criticisms. About the fee. It certainly was being charged several weeks back. I had to pay 400 baht entry, while my Thai family was free. Seems the owners are double dipping, charging rent from the vendors, and then charge their customers to go shopping there. Joe 12,  your post of Sept 23 at 19:33 needs to be corrected. It makes no sense with a very necessary word missing. As for your claim  you are always right, I remember when I pointed out how wrong you were  about a hurricane heading toward Taiwan, you sided with the absurd claim it was close enough to  affect surf on Phuket west coast beaches. Sir Burr...Commentators can say what they like, but don't expect me to sit idly by and not correct the senseless garbage that is written and if you don't like it then too bad. Like I said, I'm not really interested. They can't be ignored because they are read worldwide not confined to a selective audience. swerv: Than don't read it, ok? Keep it simple. I already did put since a while a Cordon Sanitair on Joe2. Didn't you notice that I already ignore Joe12 since 2 days PRIOR your comment about it last(?) week? So, leave me out of your judgement, Thank you. Direct your suggestion to the right person, please. Kurt: \"I always have been one of the first (invited here) to comment on matters. Right? Such is not tiresome. Right?\"
Each muppet is as annoying as the other. Do you really think that the Kurt and Joe12 show with very public squabbling on pretty much every thread, adds something for all the other readers of this news site? No, it doesn't. It is now out of hand. Seriously, both of you are acting like children. Grow up! Be the bigger man and ignore the comments of the other. Sir Burr, when you can comment or contribute with some authority...I'm not really interested. Kurt...facts? you must be joking? Like I said previously, name one instance where I have been wrong, given that you consider facts? In the interest of balance I correct you because you have no idea. Sir Burr,  I like you to consider facts. I not accept your qualification of being a muppet. I myself do not give a rating ( muppets) to other peoples opinion. I always have been one of the first (invited here) to comment on matters. Right? Such is not tiresome. Right? I not let my ears hang to other peoples comments. Right?